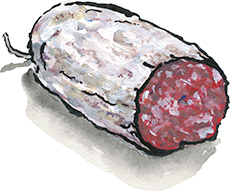 Vecchio Salami for sale. Buy online at Zingerman's Mail Order. Gourmet Gifts. Food Gifts. This is a salami I could eat every day. The flavor is smooth, clean, incredibly well balanced between sweet, porky, and just a smidge of spice from a bit of black pepper and garlic. It's great sliced thin in a sandwich or thick on a charcuterie board. It's made by Red Table Meat Company in Minneapolis. They do all the little things right, starting with sourcing heritage breed pork (a mix of Red Wattle, Berkshire, Gloucester Old Spots, Tamworth, Large Blacks, and Duroc breed pigs) raised on six nearby farms. The pigs live their lives indoors or outdoors as they please, rooting around in the grass and dirt, never receiving sub-therapeutic antibiotics. Once the whole hogs arrives at Red Table's butcher shop, they cure the pork and create some exceptional salami. The Vecchio is about an inch in diameter, coarsely ground. The meat is dotted with plenty of white morsels of fat and packed in a natural beef casing. It's aged for about four weeks, leaving it on the softer side by the time it's ready to eat.